The Carnation (E. Clem Wilson) Building, once the gem of the miracle mile in Los Angeles California stands a mere 15 stories tall. But in the early 50's it was for a time the home of the Daily Planet Newspaper! The first season of the Adventures of Superman used the exterior of this building as the Daily Planet. From the 2nd season on, L.A. City Hall was used for exterior shots. 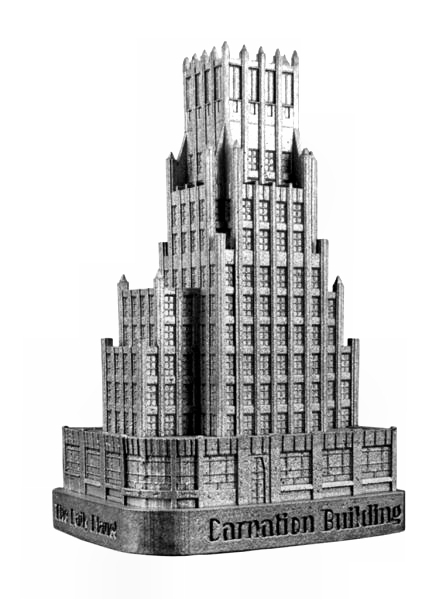 This souvenir building replica stands 4.75" tall and is finished in new pewter.